Kidding aside, I think the iDuck Floating Wireless Speaker would make a fun addition to the tub, alongside its rubber version, if you have one of course. You can relax in a hot warm bath while listening to some soothing melodies or tune in to your favorite show on the radio without risking electrocution. It would also make a great bathing companion if you have any children. It will certainly be able to decrease the number of days you'll have to struggle (and plead) with them just to make them take a bath with the iDuck around to play some Barney songs or whatever it is that kids listen to these days. So how does the iDuck work? 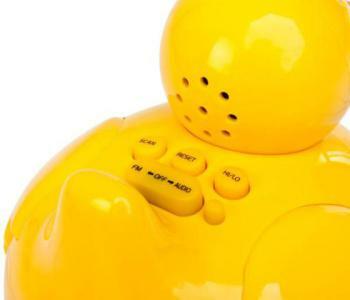 Well, you simply have to plug in your mp3 player (like your iPod, Zune, or Coby) to the egg-shaped transmitter which you should obviously put somewhere dry and press play. It's as simple as that. No wires means no muss and no fuss. 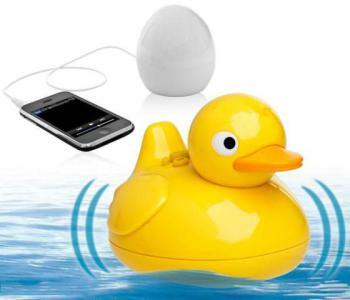 Plus the iDuck is the safer alternative compared to having a radio near the tub. Now that's a definite no-no. Allows you to play the songs on your MP3 player in the bath without soaking it. Transmitter has a range of approximately 10m. Aso features and FM radio. Compatible with sound source that has 3.5mm headphone jack (cable included). ransmitter requires 3 x AAA batteries. Duck requires 2 x AAA batteries. The iDuck is available in traditional Yellow or in glamorous Silver so take your pick. Both the yellow iDuck and the silver version are available on Amazon.com.